So many apps are using third party services to display data. Some of these services may give detailed information in HTML format. Why would they give information in HTML? Simple it’s universal. Everyone can display HTML. All of the platforms have some form of a webview control to display HTML. I recently came across such a service that actually gave information in both plain text and HTML. The plain text did not offer the detail that the HTML content did. 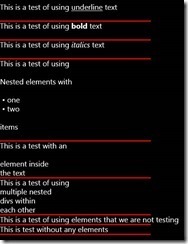 So I set out to create a way to display the HTML inside a TextBlock. You may ask why I did not use a Webview control and I’ll say with a smile “Because I didn’t want to”. I’ll be 100% honest here, I took some pointers from the HtmlAgilityPack. I should note that this is not intended to display an entire website. You can adjust it to work, but just don’t. 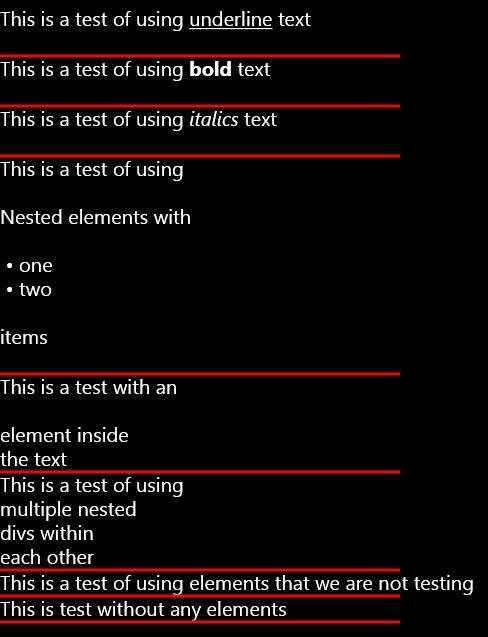 To tackle this task I created a new Behavior that would adjust the text of a TextBlock when it was loaded. The Runtime Interactivity SDK does not include a base Behavior class like the other Interactivity SDKs. Instead of implementing the interface every time I want to create a behavior, I like to use a base Behavior class. You can also get the base class here. We’ll first start by listening to a few events of our TextBlock. The behavior will listen to the Loaded and the LayoutUpdated event. We need to listen to these events because the TextBlock does not have a TextChanged event. The TextBlock will first load but if you are getting data from a service, the text will not be populated yet. The LayoutUpdated event will let us know when the text is populated. The UpdateText method will convert the text to XML via the XElement class, traverse the nodes to add text elements and then unsubscribe from all events. We’ll assume the text of the TextBlock will not change again. // Just incase we are not given text with elements. // reset the text because we will add to it. The ParseText method is the meat to this whole meal. We’ll check the type of each element to determine what to do. If we find a <u> element we’ll start adding underline text. If we find a <b> element we’ll add bold text and so on. /// Traverses the XElement and adds text to the InlineCollection. // Add two line breaks, one for the current text and the second for the gap. This does put a line break in when we really don’t need one. For the services I’ve used I haven’t seen this too often. To check if we do need to add a line break at the start of the elements, we need to check the previous InlineCollection to see if the last item in there was a LineBreak. /// Check if the InlineCollection contains a LineBreak as the last item. "This is test without any elements"
For this I put a line at the bottom of each element so you can see where it stops. You can see the extra line breaks for the paragraph elements. This won’t render prefect html and once again while this will work for a webpage, it shouldn’t be used to render an entire webpage! You can download a complete working Universal sample.